I can’t tell you how excited I am to be collaborating with the wonderful Swoon Editions again to run this giveaway. You may have seen my post last week, showcasing my wishlist from the latest Swoon Editions collection, so I’m thrilled that they’ve partnered with me again today. 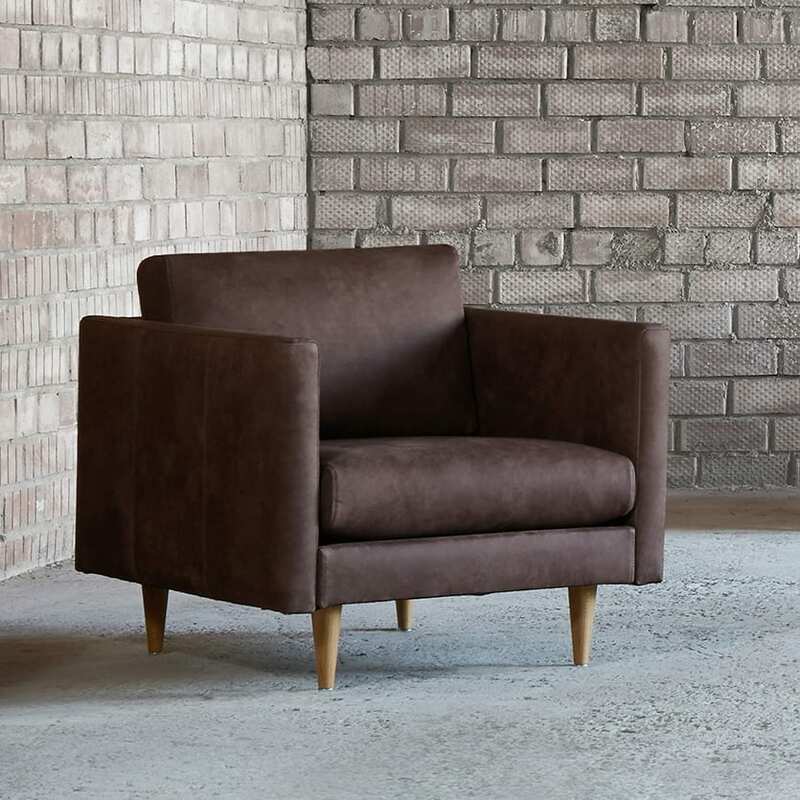 You have the chance to win a stunning Tivoli armchair in stonewashed leather with oak legs worth £479. Wouldn’t that be the perfect way to update your home? Add a little architecture to your living room with the neatly structured Tivoli armchair. A hand-made design, Swoon Editions drew inspiration from mid-century’s love of clean lines, minimal styling and ability to hold colour with ease. The arms are positioned high so you feel enveloped, while the large cushions are a mix of feather, polyfibre and foam to strike what we think is the perfect balance between softness and support. The best thing about the Swoon Editions European sofa workshop is their commitment to quality. They’re known for being specialists in upholstery and Swoon Editions realised very quickly how much they care about every last design detail – from hand-stitched seams to the layers of foam padding. Founded 14 years ago, it’s still run by the founders out of a very small town known locally as being the coldest place in Estonia. Please note: Delivery will be between 6-8 weeks after the giveaway has closed. Follow the instructions in the Rafflecopter widget below tweeting the message to enter the giveaway. You can then unlock lots of extra entries giving you lots of extra chances to win this stunning armchair. your tweet is too long, cant enter comp? I love the classic lines of their designs. Looking good for a present to my aunt. Would love to win. Wish me luck! The Swoon designs fit both traditional and modern rooms, and are items you would keep rather than keep changing out. It is all so swoonworthy and very designer looking! They are so stylish but still look very comfortable. You’re tweete is too long .. I took some of it out, so not sure if it will still be picked up by you’re rafflecopter widget? They are really sleek but look so comfortable too absolutely lovely style!!! I like the styles available and some unique pieces – something for everyone, and not ridiculously expensive for the quality and designs available. Personally, I love the fact that swoon furniture looks smart! They are so stylish and best of all would fit right in my house just perfectly. I love everything about Swoon, but mostly that that everything seems very carefully chosen to fit into an overall theme of well-designed furniture and home accessories. I am a big fan of mid-century style, so am absolutely in love with this chair! Comfy seats, made to measure. Very simple but very chic! I love the designs. Very stylish and beautifully made. They are stylish and elegant and real statement pieces. Stylish and beautiful, I love these pieces! Beautifully designed and a style of its own. They are just so stylish! I love the simple lines, elegance, comfort and solid contruction . Love the style, its very me! they look really modern and cosy. I love how modern and elegant they are! The fact that a lot of their range would suit both traditional and more contemporary settings! I really like the stylish designs! THE QUALITY IS AMAZING & EVERYTHING IS REALLY STYLISH. I like that they are simple in design but very stylish and modern and each piece would be a show piece. It is stylish and looks comfortable. I love Swoon Editions stuff. I’m waiting for a cabinet right now and have loads on my wishlist! Stylish and practical – whats not to love!!!!! They’re simple, stylish, modern and unique. They would add that extra special something in any room! I love the contemporary styling of many of their products; their mango wood products, especially the console table and side table are beautiful and the side table would fit in any room, in a bedroom as a bedside table but equally as good in a sitting room. Their upholstered products are as equally inspiring, I particularly love the Benny Ottoman and the Travis Sofa. I like how the site is easy to find what you’re looking for. I wanted to find an ottoman footstool and I found one straight away. I love that their fashionably elegant furniture suit both traditional and modern room decor. I love the range. Its stylish and elegant. I love the clean lines and designs of this collection. They are very stylish pieces which look more expensive than they are. So very stylish and modern but still with a timeless look. They are unique, classy & stylish, yet affordable. I posted this comment in error. It must have been the last thing I copied to my clipboard. Could you delete this comment, and the reply please. Thanks. I really love that each of the pieces in the collection is very bold. I think even just having one piece, even in a relatively sparse room, would really complete it. I could easily imagine having this armchair in the corner of the room, with no other furniture on the same side/around it, but being happy with the overall look. How to win this beautiful furniture? It’s so Unique and stylish and all of your furniture would light up any home no matter what room you put it in..
All the furniture looks well made , stylish and of excellent quality. I love that each of the Swoon Editions pieces look so beautifully hand-crafted – they each feel eclectic and unique, but at such a tremendously affordable price. From ottomans to reclaimed pine blackboards, it feels like you could fill your house with unique designer style at a fraction of the cost [and maybe even try to fool your friends that you scoured Parisian antiques markets or Chelsea showrooms to find them all 😉 ] Affordable designer rooms to make you swoon – what’s not to love? I love how down to earth and warm they look. I love how stylish they look, how comfortable the look and the design! The designs are so chic and stylish! I love the quality, style and comfort best of all! It’s stylish but not trendy – so timeless! I love the clean lines, the range looks timeless and classic. I love the sheer elegance of their designs, the mixture of the vintage with a really modern contemporary twist that would adapt to any home decor theme! It compliments my husbands furniture. I think it’s because the designs would look equally at home in modern and traditional homes. There furnature looks stylish and high quality that could fit anywhere in the house. I love the stylish designs! The shape of the furniture looks like it would fit into my home and there is variety in the range. The simple, yet elegant designs! As well as being stylish it’s comfortable too. I love the style of their designs, all very modern yet quirky! great pieces to have around the house at affordable prices! What’s not to love? I love how stylish they are. The furniture is both stylish and practical. Very contemporary, without looking ridiculous. Lovely items that would look fantastic in any home!